To be able to play tennis, you have to understand the court that you’re playing on. The lines are one of the things that you need to be able to understand in order to know which balls are out and which are in play. The lines are the same in all countries and the line dimensions are also the same throughout the world. In a singles match (one vs, one) you may not hit beyond the baseline but you are allowed to bounce the ball on the line and it will be counted as in play. However, the ball must not go over the first sideline when playing singles. In double matches (two vs. two) the sides are increased by 1,37 meters on each side and you then play with the lines furthest to the side. Clay courts make for a slow game and it can be tiring when you have to run a lot. While playing on a clay court, it’s all about getting top spin (screw) on the ball in order to increase pace. On a Clay Court there will be several wrong bounces since it’s a little uneven, which means you must stay fully focused at all times. Especially on the lines there are often wrong bounces so you have to be quick. 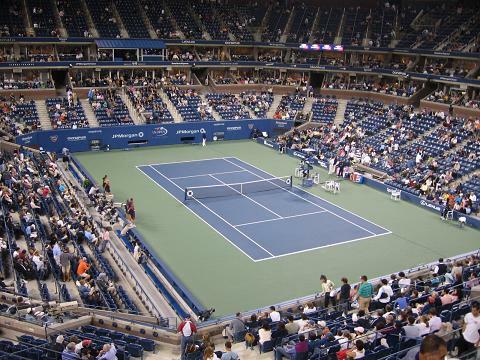 Hard courts allow the fastest movements and rallies can sometimes last only a few seconds. Here it’s all about keeping your feet movement constant in order to keep up with the pace, moving up and down the court and using as much power as you can to beat your opponent. Grass courts allow a fast paced game but the balls often bounce low, meaning you have to be both quick and fully focused. 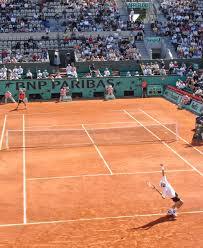 Many players adopt a serve and volley approach on grass, but long rallies can be achieved. 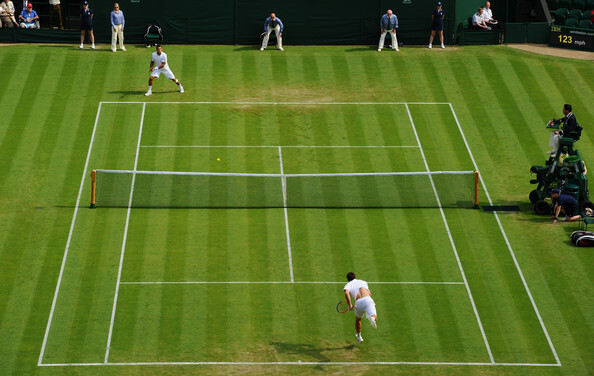 The condition of a grass court can deteriorate over the course of a tournament and bounce can become uneven.